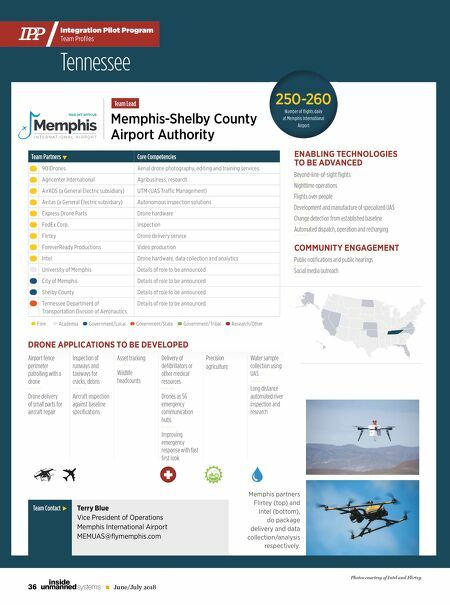 36 June/July 2018 unmanned systems inside Terry Blue Vice President of Operations Memphis International Airport MEMUAS@fl ymemphis.com Team Contact Team Partners Core Competencies 901Drones Aerial drone photography, editing and training services Agricenter International Agribusiness, research AirXOS (a General Electric subsidiary) UTM (UAS Traffi c Management) Avitas (a General Electric subsidiary) Autonomous inspection solutions Express Drone Parts Drone hardware FedEx Corp. Inspection Flirtey Drone delivery service ForeverReady Productions Video production Intel Drone hardware, data collection and analytics University of Memphis Details of role to be announced City of Memphis Details of role to be announced Shelby County Details of role to be announced Tennessee Department of Transportation Division of Aeronautics. Details of role to be announced Memphis-Shelby County Airport Authority Team Lead ENABLING TECHNOLOGIES TO BE ADVANCED Beyond-line-of-sight fl ights Nighttime operations Flights over people Development and manufacture of specialized UAS Change detection from established baseline Automated dispatch, operation and recharging 250-260 Number of fl ights daily at Memphis International Airport Photos courtesy of Intel and Flirtey. 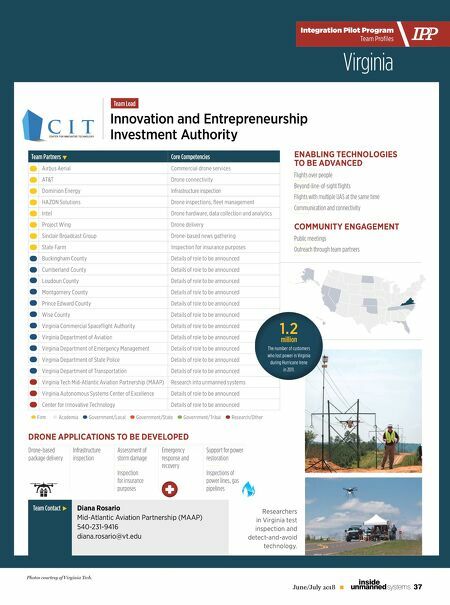 COMMUNITY ENGAGEMENT Public notifi cations and public hearings Social media outreach DRONE APPLICATIONS TO BE DEVELOPED Airport fence perimeter patrolling with a drone Drone delivery of small parts for aircraft repair Precision agriculture Asset tracking Wildlife headcounts Inspection of runways and taxiways for cracks, debris Aircraft inspection against baseline specifi cations Water sample collection using UAS Long distance automated river inspection and research Delivery of defi brillators or other medical resources Drones as 5G emergency communication hubs Improving emergency response with fast fi rst look Firm Government/Local Government/State Government/Tribal Research/Other Academia Tennessee P P IP Integration Pilot Program Team Profi les + Memphis partners Flirtey (top) and Intel (bottom), do package delivery and data collection/analysis respectively.